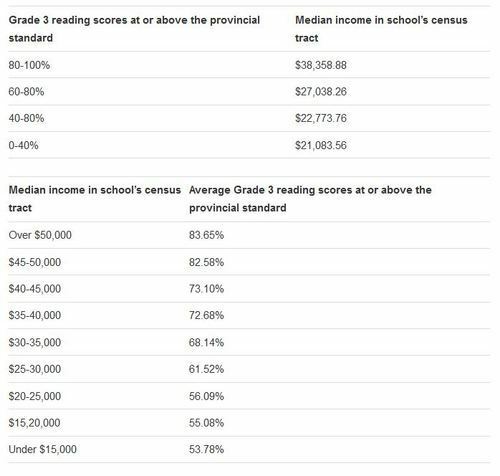 We launched our education series yesterday with an ambitious visualization of Grade 3 standardized tests across Ontario, covering 3,792 schools’ performance in reading, writing and math. We filed an FOI request for EQAO results for the whole province as a way of avoiding having to sign a research agreement which was impractical for journalism projects. The EQAO itself has come in for its share of criticism, as have standardized tests in general. My own view, for what it’s worth, is that the big patterns they reveal almost certainly have value, but that it would be unwise to get too wrapped up in the details. Separate and public schools are mixed on the same map. One thing I immediately noticed on the map screenshotted above was that the red schools, which fall below a given score in reading scores (percentage of pupils meeting or exceeding the provincial standard as an average of the available years) was that it had the classic check-mark shape of bad social indicators in Toronto: low incomes, homicides with male victims, certain kinds of disease, high school dropouts and on and on. The same pattern also works in other Ontario cities: Hamilton, Windsor and Oshawa, as examples. To confirm what the map seemed to be showing, we created a new map superimposing the school results on another map (screenshotted above) showing median incomes from the 2006 census.